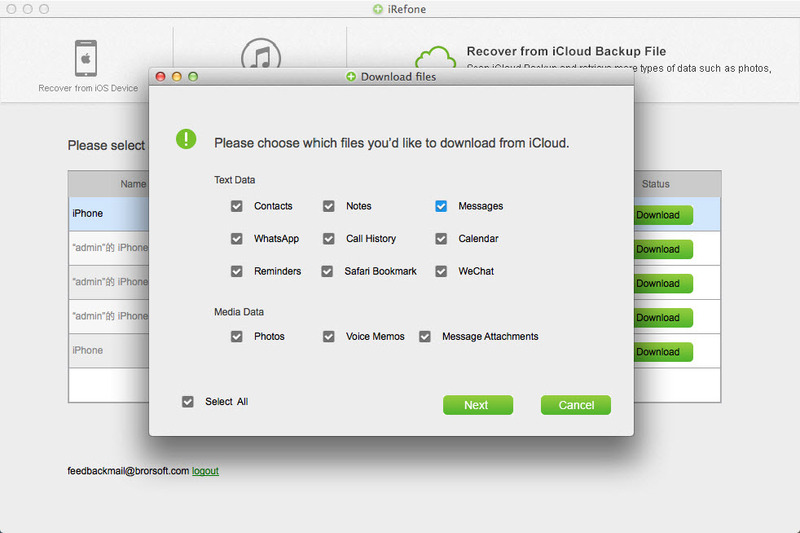 iRefone for Mac recovers up to 13 types of lost files from your iDevice. 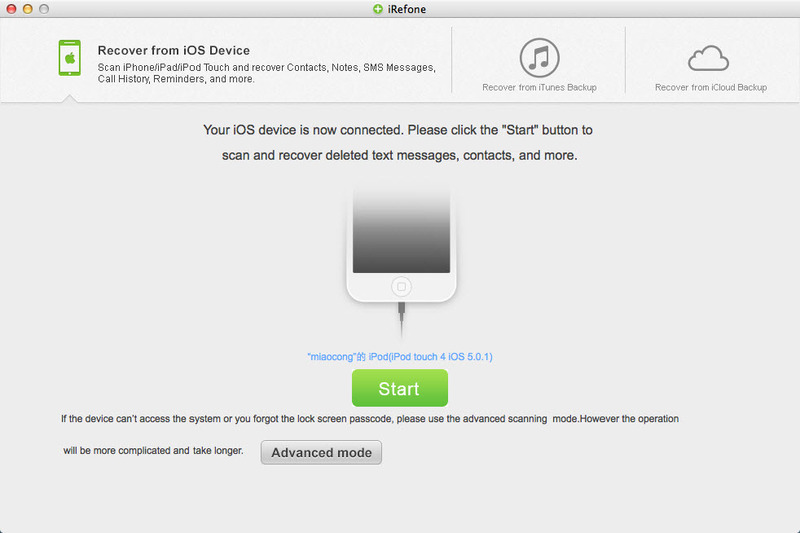 It offers you 3 solutions to recover lost data from iPhone, iPad and iPod touch including scan your iOS devices, extract your iTunes backup files, download and recover data from iCloud backup. Follow the guide below to retrieve your lost files. In this way, you need to have your iPhone, iPad or iPod touch at your hand. Also, your device can be recognized by the computer. Then you need a digital USB cable. 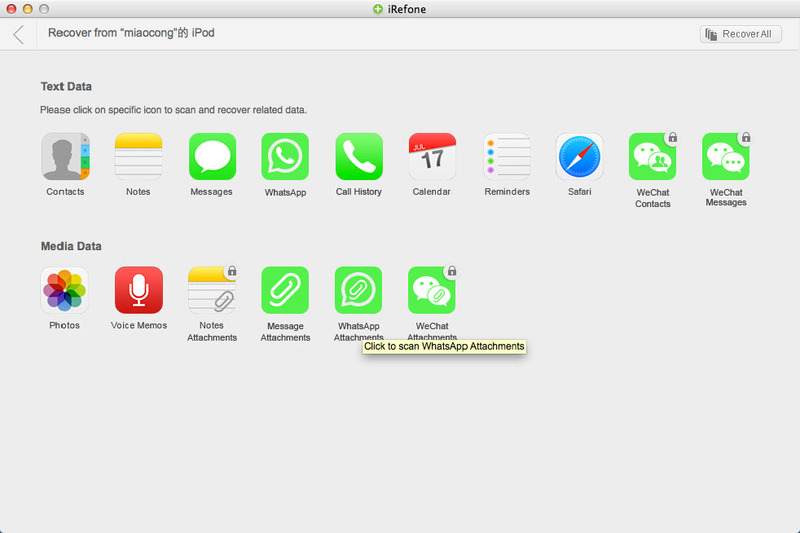 Install and run iRefone for Mac on Mac, connect the device you want to recover with Mac via USB cable.Then you will see the interface as follows, click "Start" to access the data in device. 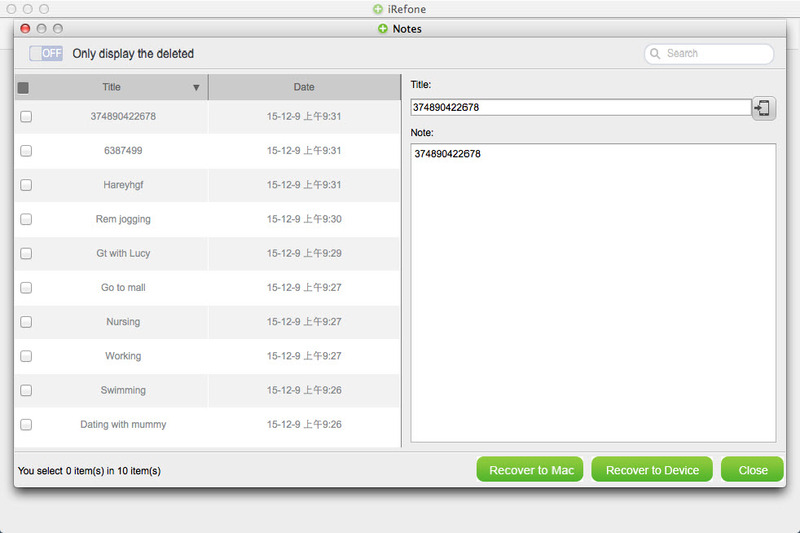 When the scanning is finished, you could preview all contents of the selected data, including these deleted one. (Contacts, Messages, Call History, Notes, Calendar, Reminders and Safari Bookmark) You can tick any items you want and store them on your computer by clicking on the "Recover to Mac" button. If you want to preview other data, just click the "Close" button to exist the current preview interface and click other icon view other data. 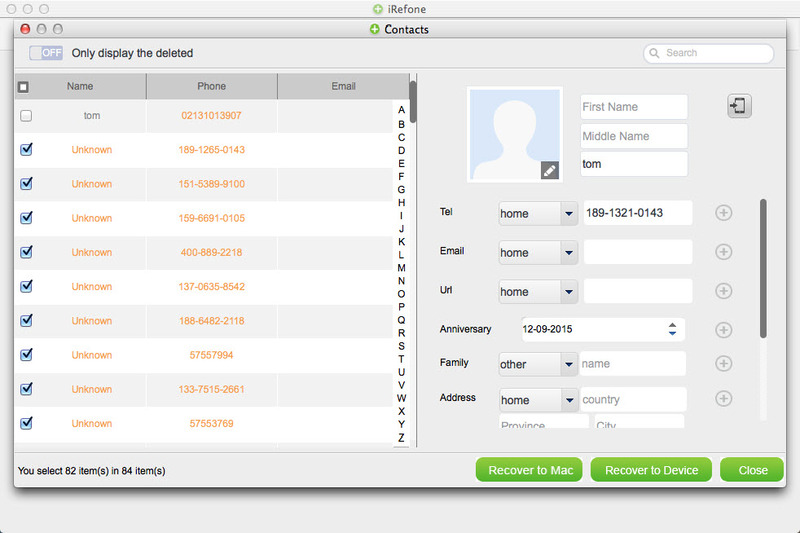 Tips: iRefone for Mac supports to transfer recovered Notes, Contacts directly back to device. 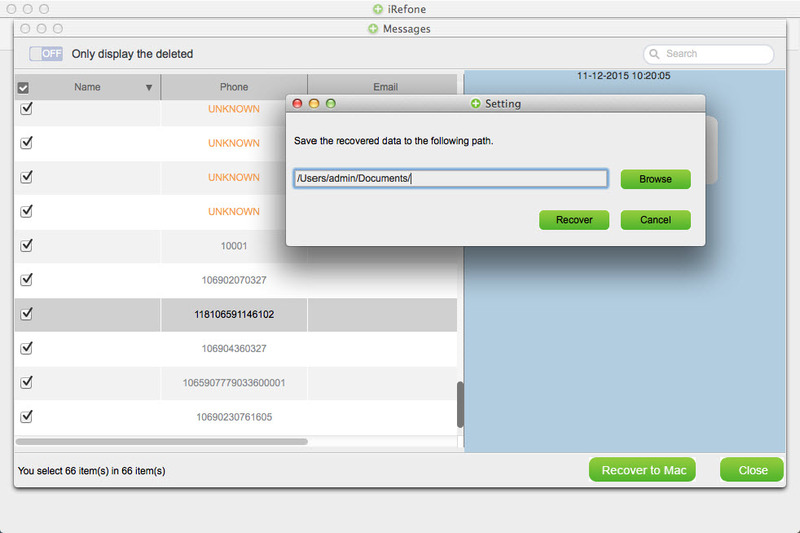 After scanning these two items, pick out these notes or contacts you need and click "Recover to Device" button on the interface to transfer these recovered Notes and Contacts directly back to your device. 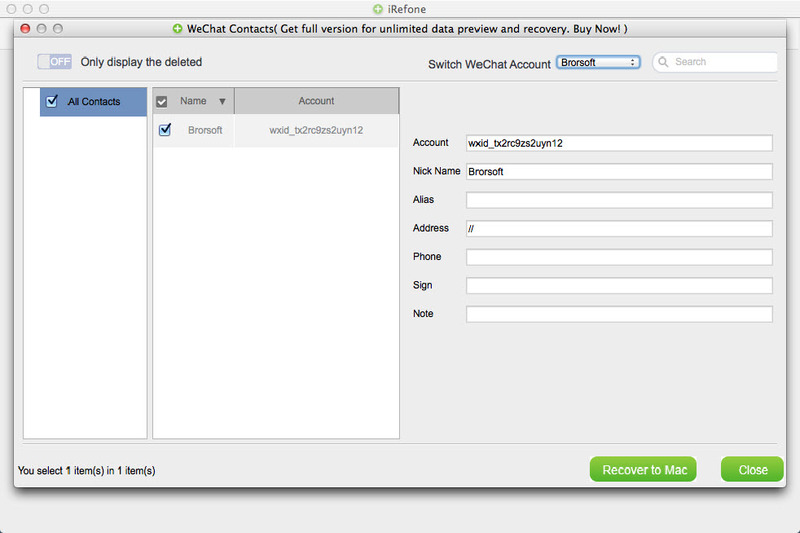 You can also edit notes and contacts and save the modified data. Apple doesn't allow anyone to manually access and view data in the iTunes backup file. You can only restore the whole backup to your device, and then you can know what it contains. 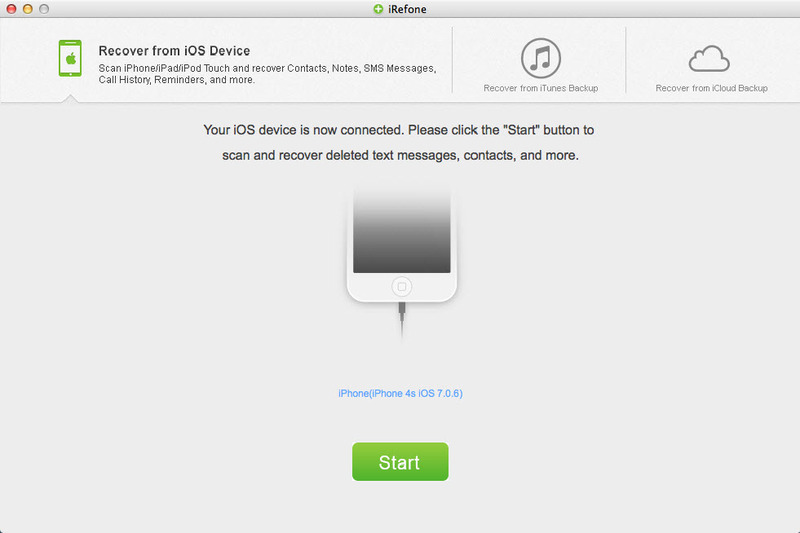 With iRefone for Mac, you can do it now. 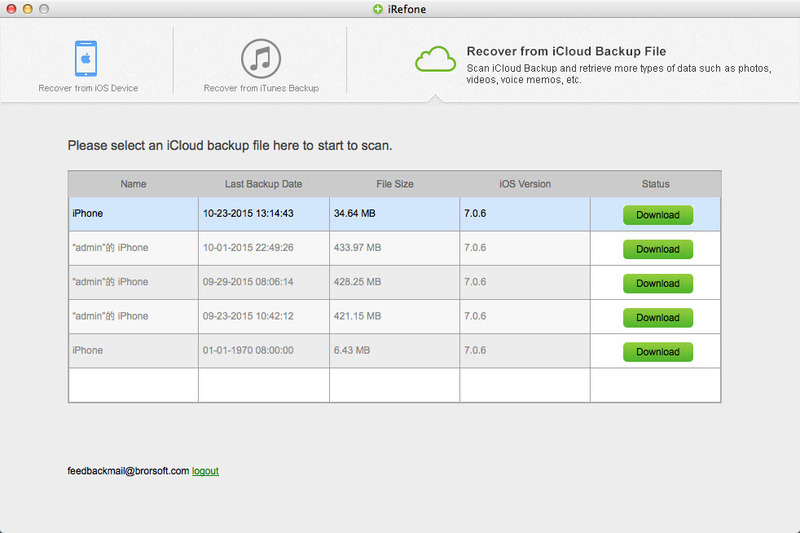 Run iRefone for Mac on Mac, Choose "Recover from iTunes Backup" on the main interface. All the iTunes backup files of your iOS Device which has ever synced with iTunes on this Mac will be automatically found and listed here. You can choose the one you want and click "Select" to access the data interface. Tips: If your iOS device backup is not displayed here, it's probably because your iOS device has not synced with iTunes on this Mac or you save the backup in other location. You can click "Select more" button to choose the backup by yourself. When the scanning is finished, you can selectively mark and recover those you want by click the "Recover to Mac " button on the bottom-right to save them on your computer. 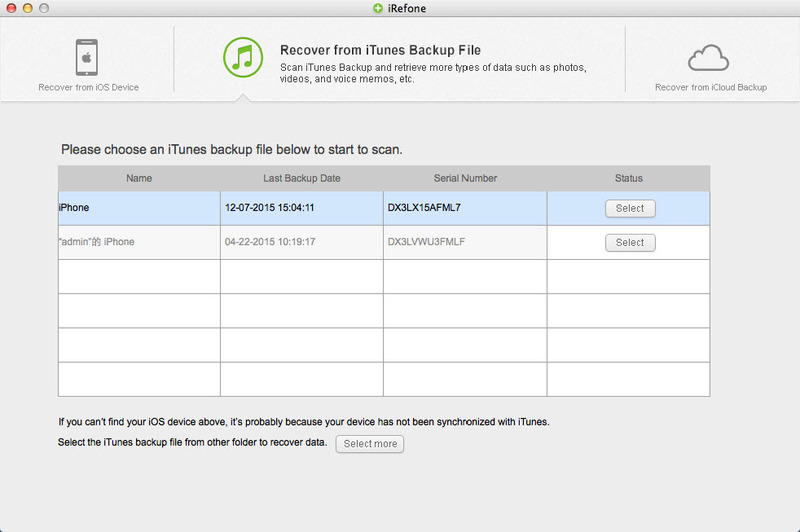 Just as the iTunes backup file, iCloud backup files can't be easily acessed. What Apple allows you to do is acessing and downloading contacts from iCloud.com on your computer. 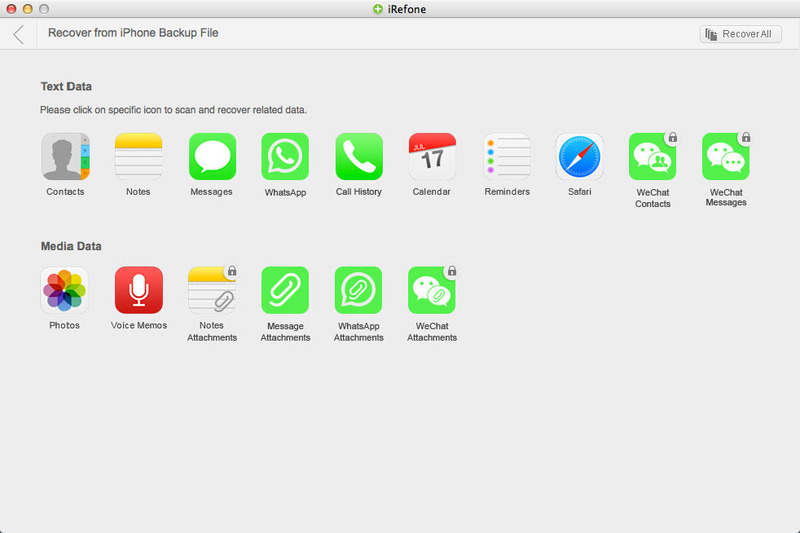 As to the other data, you can't read them, except restoring the whole backup to your device. 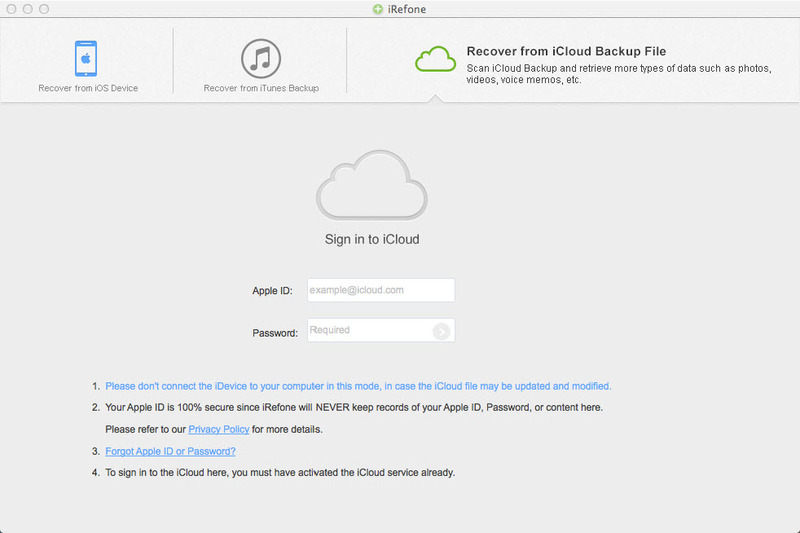 Now, follow the guide below to learn how to download and extract data from iCloud backup on your computer in steps. 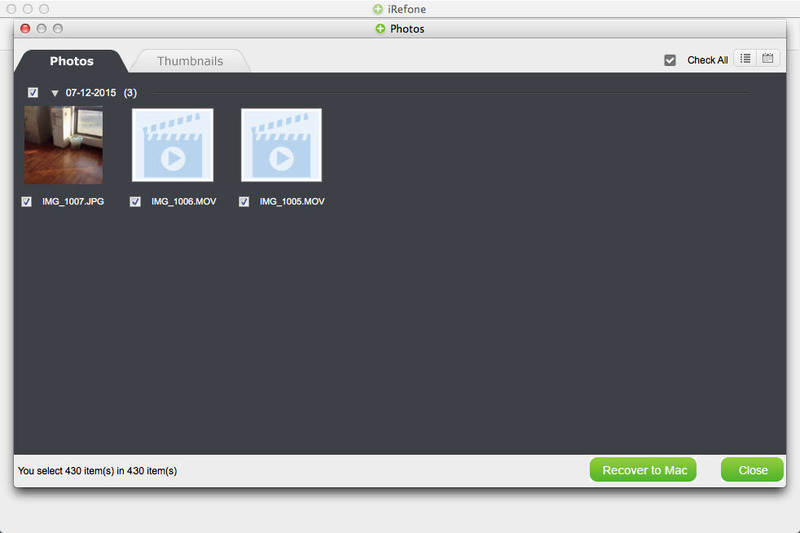 Choose "Recover from iCloud Backup File" from the top menu on the program's primary window. Then you'll see the window as follows. You need to enter your iCloud account and the password to log in, so that you can download the backup file. Note: It's totally safe here to log in your account. Brorsoft won't take any record of your account or the data content at any time. You're always the only person who can see the account and acess the data. Brorsoft takes your privacy seriously.